& from Republic of Ireland / Éire including Ardkill. This stunning original is another star find by our Japanese buyer. In fact, it's extremely rare to find a copy complete with its original purple obi strip. The album is reasonably easy to pick up if you're not bothered about condition and, of course, it never has the obi. Remarkably, this LP both retains the obi and is as close to MINT condition as you're ever likely to find. The heavyweight gatefold pasted picture cover is free of seam splits and the wide spine displays clearly legible print with only the faintest parallel line crease down the centre. Internally, the green paper pasted inner shows few signs of wear, just some spots of foxing toward the centrefold and upper edges. The bright blue print is clean and legible. The vinyl is imaculate. The Polydor label displays few spindle traces around the centre hole. The all-important obi has no paper loss, with clean straight edges and solid block purple colour to the front. The back retains the often removed re-order tag. Being white, the back of the obi shows many brown spots of foxing, really the only blemish on an otherwise pristine original. 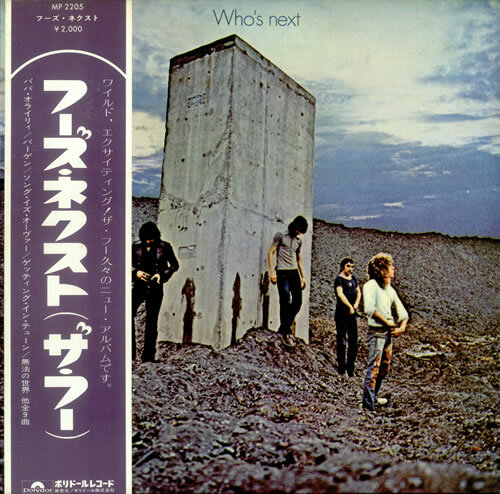 Product Information The Who Who's Next - 1st + Obi Japan vinyl LP album (LP record).